MedWetRivers project covers all of the Protected Areas Natura 2000, fluvials and wetlands in the Mediterranean bio-geography of Castilla y Leon with an extended and common problematic, constituting a priority for conservation in levels of region, state and continent (foremost in Mediterranean wetlands). The 57 Natura areas included in the LIFE project bring a great spacial heterogeneity. on the one hand meadows, wetlands and fluvials strictly said, limited to a layer of water or the current of water with a small strip of protection; and on the other hand, wetlands that are quite extense due to their coincidence in the Red De Espacios Naturales (Natural Areas Network) of Castilla y Leon-, given that the "water element" is paramount and the backbone of the area. All these areas represent similar natural values, being directly dependent on water. The ecological processes and the natural values (fauna and flora) to which they shelter are, to a large extent, common to the grouped areas, and being so, the MedWetRivers project prefers a programme which is to establish a procedure for monitoring and coordinating, through a Monitoring Program and a Natura 2000 Network Management Program that should positively affect the conservation status of the species and types of habitats of interest that give them value and attention, and that would also serve to optimise the scarce resources that are dedicated to the conservation of the natural environment. CISs and SPAs river flows that are the object of this project are distributed throughout the region, with some of them having physical continuity in adjacent territories. this contributes to the enhancement of the ecological connectivity between the Castilian-Leonese Natura 2000 network areas and the rest of the neighboring communities. 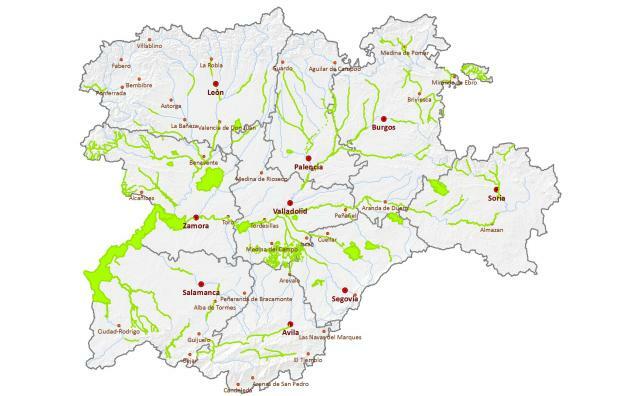 The MedWetRivers project represents 39.2% of the SCI area of the Natura 2000 Network of Castilla y León, 16.2% of Spain and 3% of the European Union. If we pay attention to birds, the project includes 48.6% of the SPA area of the Natura 2000 network of Castilla y León, 19.6% of Spain and 3.5% of the European Union. In total 418,179.23 ha (17% of the Natura 2000 Network in CyL) representing 48 types of habitats of interest in the community (10 of them in priority of protection); 8 species of invertebrates, 6 species of fish, 11 species of flora, 13 species of mammals and 4 species of amphibians and reptiles of community interest (4 of them priority). We also find in these zones 169 species of birds, 71 in Annex 1 of the Birds Directive and the rest migrating species of regular presence not included in said Annex.